I have ever been fascinated by the symmetrical beauty found in flowers, leaves and plants. This photo shows one of the flowers I love best, in all it's loveliness. Five rounded petals within--five pointed ones outside...The Creator loves flowers, I think. Here is another heart rock I found at the ocean last week. This heart was bathing in a sunny depression of rock found along the edges of the cliffs of one of Oregon's jewels of the sea, Pacific City. 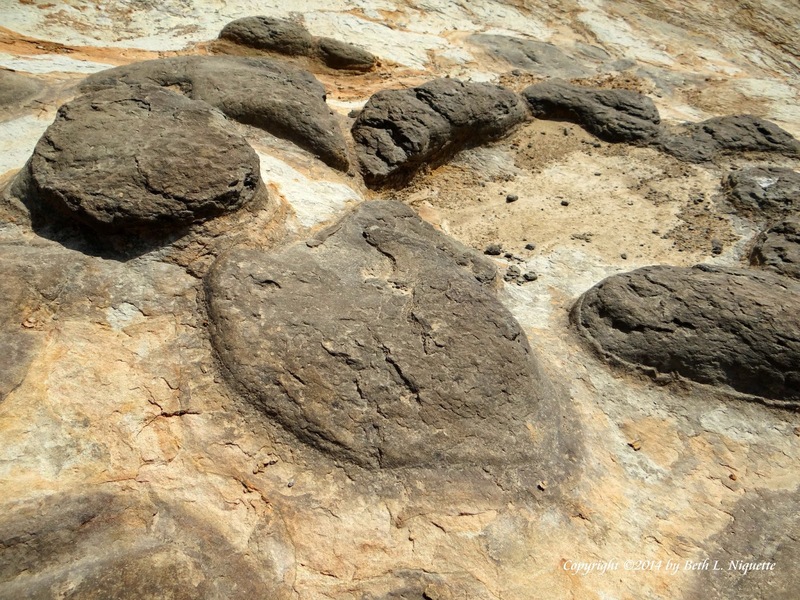 If you notice, not only is the rock in the shape of a heart--but there is a tiny heart on the rock itself. Just perfect for Guest Heart Thursday! I always feel privileged when I find a heart such as this breaking through the smooth surface of the stone cliffs near the sea. I thought this one, which I spotted last week, was perfect for Guest Heart Thursday. 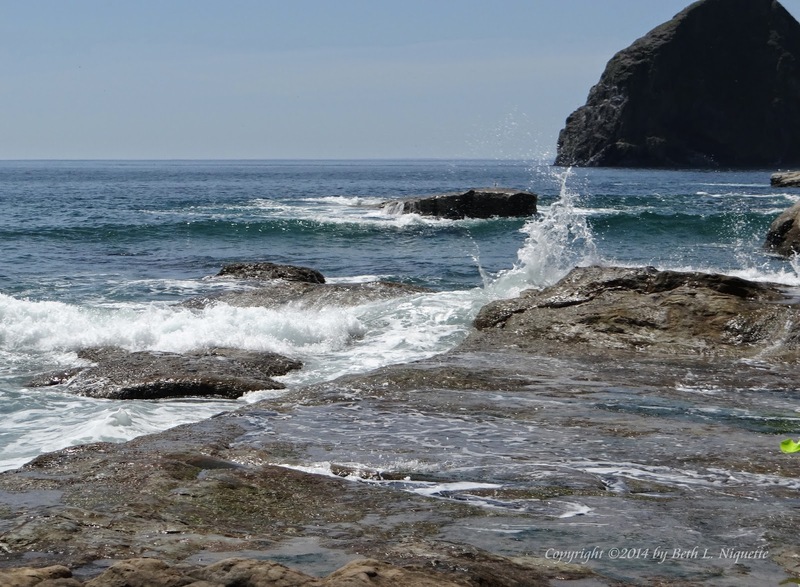 Here is where the surf pounds against the rocky tide pools beneath the shadow of Teacup Rock. A closer look at the photo earlier today and I found another heart in the spray. Can you see it? 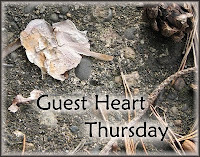 Have a lovely day, and Happy Guest Heart Thursday! If you look closely, you can see a heart of blue is within a heart of cloud. I am continually amazed at how many hearts can be found in nature. This is a heart I captured in the sky over our home a week ago. Amazing! 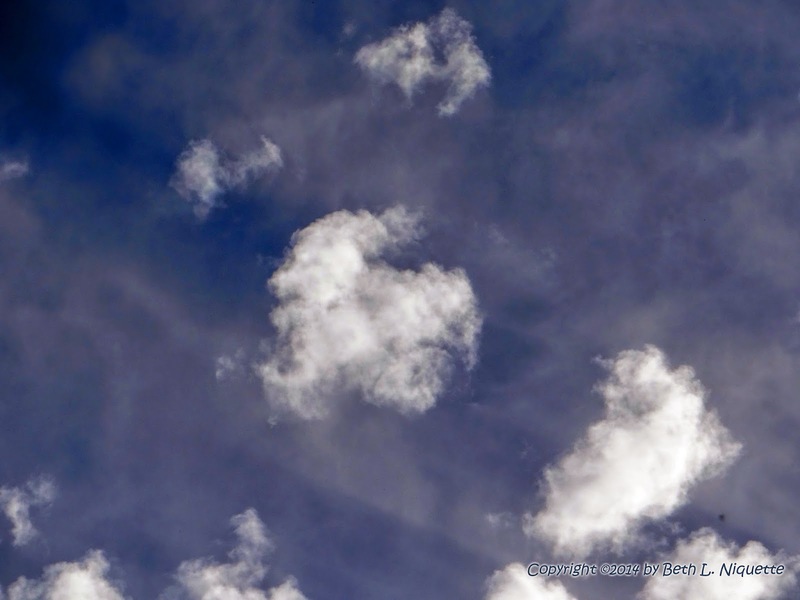 Perhaps this is not a truly geometric form--but a cloud heart is still one of those wonderful finds with meaning. Here is a neatly squarish cloud with circle inside of it. I captured it with my camera on this past week. It always boggles my mind to see straight lines in the clouds--and that perfectly centered circle is fun, too. Monday evening, I was waiting in the car for my husband, when I looked up and spied someone watching. So...have you ever had the feeling you were being watched?! (grin) This time it wasn't anyone I expected! This photo, though cropped and leveled has NOT been altered in any way. This is just as I saw it. Note the triangle eyes. I went on a day trip to The Dalles in Oregon's spectacular Columbia Gorge. I had not visited there in spring before. What a beautiful sight--there were flowers everywhere. I found this fiery flower heart on the hills where a real forest fire raged late last summer. Here's a closeup of this wonderful flower. Such a beautiful blossom--so bright and bold in the sunshine. As you can see--the flowers on the hillside are just incredible. Can you find the fire flower? Just a spot of red amongst the yellow blooms.